Background Acute stroke from tandem extracranial carotid artery and intracranial large vessel occlusion poses challenges for emergency endovascular treatment. Establishing and maintaining patency of the carotid artery and avoiding intracranial hemorrhage are competing concerns. Methods Twenty-three consecutive cases of emergency carotid stenting followed by mechanical thrombectomy identified by retrospective review of the endovascular ischemic stroke database maintained prospectively at our institution since January 2011 form the basis for this report. No cases were lost to follow-up. Results Patients were selected with CT angiography or MR angiography and diffusion weighted imaging. Carotid stenting was successful in all cases, and establishment of Thrombolysis in Cerebral Ischemia 2A, 2B or 3 flow was successful in 21/23 (91%). 12/23 (52%) patients achieved a modified Rankin Scale score of 0–2 at 90 days. Symptomatic intracranial hemorrhage (SICH) occurred in 5/23 patients (22%). Of 13 patients receiving an intravenous loading dose of abciximab during the procedure, 4/13 had SICH (31%) compared with 1/10 (10%) of those who did not. Of seven patients who received intravenous tissue plasminogen activator prior to the procedure, none had SICH. 90-day mortality was 9/23 (39%). All patients who had SICH were above the median age. Conclusions Primary stenting of the extracranial carotid artery combined with intracranial mechanical thrombectomy can be an effective treatment for tandem occlusions, can be performed with a high rate of technical success, and can achieve good clinical outcomes in selected patients. However, the incidence of SICH may be higher than in other patient populations and may be associated with the use of abciximab and advanced patient age. Acute occlusion of the extracranial carotid artery with thromboembolism to the carotid terminus or middle cerebral artery (MCA) represents an important minority cohort of patients for possible endovascular treatment. Various possible approaches include intra-arterial thrombolysis without attempted treatment of the extracranial carotid artery occlusion; angioplasty alone or angioplasty and stent placement followed by treatment of the intracranial occlusion with thrombolysis or mechanical thrombectomy; or treatment of the intracranial occlusion with intra-arterial thrombolysis or mechanical thrombectomy first followed by treatment of the extracranial occlusion. No comparison of these possible strategies, all with merits and pitfalls, exists. One is managing the competing goals of establishing and maintaining patency of the vessels and avoiding intracranial hemorrhage. Based on prior experience, our preferred method of treatment is primary stenting followed by mechanical thrombectomy. Patients who have not received intravenous tissue plasminogen activator (tPA) receive a loading dose of intravenous abciximab at the time of stent placement. This cohort is not represented in larger prospective studies of mechanical thrombectomy because the presence of a proximal occlusion is an exclusion for most trials. We reviewed our series to determine how the outcomes and complications compare with the limited published experience in this patient group and with those not requiring intervention for tandem lesions. We retrospectively reviewed the endovascular stroke database maintained prospectively at our institution since January 2011. All cases of intended endovascular stroke intervention are entered in the database, with follow-up modified Rankin Scale (mRS) at 90 days, obtained by face-to-face visit when possible and by telephone interview otherwise. Twenty-three consecutive cases of emergency carotid artery stenting followed by mechanical thrombectomy between January 2011 and September 2013 form the basis for this report. No cases were lost to follow-up. Just one case in the larger database (a non-stent case) lacked follow-up at 90 days. All of the patients were treated by two interventional neuroradiologists. As this is a retrospective study there was no set protocol for treatment. The use of anticoagulation and antiplatelet therapy was at the discretion of the treating physician. All patients received 300 mg aspirin suppository on the table. One patient known to be on clopidogrel did not receive additional antiplatelet therapy. Abciximab was administered intravenously in a loading dose of 0.25 mg/kg just before stent placement in 12 patients who had not received intravenous tPA. One patient who did receive intravenous tPA received an intravenous loading dose of abciximab after developing stent thrombosis during the intervention. Unfractionated heparin was given in low dose (usually 2000 units) or not at all. One patient received a total of 13 000 units of heparin due to a lengthy procedure (>240 min). If a CT obtained 24 h after the intervention demonstrated no hemorrhage, patients were loaded with 600 mg clopidogrel at 24 h if they had not received abciximab. Patients who had received abciximab were loaded at 48 h.
Device use was at the discretion of the treating physician. When mechanical clot retrieval was planned, a 9 F balloon occlusion guide catheter (Stryker Neurovascular, Fremont, California, USA) was used for the stent placement and clot retrieval. This was the strategy for all carotid terminus occlusions and some MCA occlusions. A 6 F guide sheath (Cook Medical, Bloomington, Indiana, USA) was used when stenting followed by clot aspiration was planned, which was a strategy employed for some MCA occlusions. Embolic protection filters were used when the internal carotid artery (ICA) was patent (in the case of severe stenosis, as opposed to occluded) and could be placed above any thrombus in the ICA. For most cases, a closed cell stent with the best radial force was chosen (XACT; Abbott Vascular, Santa Clara, California, USA), in order to avoid post-dilation and to facilitate passing additional catheters and devices through the stent. An open cell stent (Precise; Cordis, Bridgewater, New Jersey, USA) was used in three cases due to curvature of the artery at the site of the stenosis. Various FDA approved thrombectomy devices were used during the course of the study (Merci and TREVO, Stryker Neurovascular, Fremont, California, USA; Penumbra, Alameda, California, USA; Covidien, Mansfield, Massachusetts, USA). The strategy for sedation and anesthesia for all endovascularly treated stroke patients evolved during the study, with almost all patients under general anesthesia prior to January 2012 and almost all patients treated with monitored anesthesia care (and usually only local anesthetic) thereafter. Following the procedure, all patients were admitted to a dedicated neurocritical care unit with a target systolic blood pressure of <160 mm Hg for patients in whom the intervention was successful and a target of 180 mm Hg in the two in whom patency of the MCA was not established. Patient care was thereafter directed by the neurocritical care specialist and neurohospitalist, with inpatient or outpatient rehabilitation as appropriate. The primary results are presented in tables 1 and 2. There were 23 patients with a mean age of 69.5 years (median 70, range 45–86). The mean and median NIH Stroke Scale (NIHSS) score on presentation was 17 (range 9–25). Diffusion weighted imaging was obtained in 22 patients, with a mean core infarct volume of 39 mL (median 30 mL, range 5–84 mL), with one outlier at 142 mL. No patient in the cohort had admission serum blood glucose above 400 mg/dL. Admission glucose could not be found in one patient, a non-diabetic. 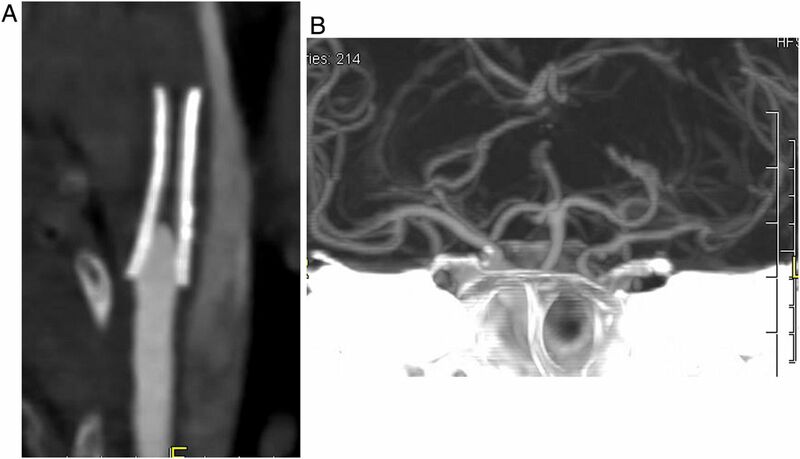 The target intracranial artery was the internal carotid artery (ICA) terminus and MCA in nine patients, the M1 segment of the MCA in 12 patients, and the proximal M2 in two patients. Revascularization was technically successful in most patients. The carotid artery was successfully stented in all patients. Thrombolysis in Cerebral Infarction (TICI) scores for the target intracranial vessel of 3 or 2B were obtained in 17 patients (74%), and TICI 2A or better in 21 patients (91%). Two patients had TICI scores of 0. The latter two patients both had M1 occlusions and an absent anterior communicating artery. Both were clinically improving after stent placement, possibly due to improved inflow to the pial collaterals. There were no cases of embolization to a new territory (eg, the anterior cerebral artery), and no vessel perforations or iatrogenic dissections. Clinical outcomes were highly polarized. An mRS score of ≤2 was obtained in 12 patients (52%). Nine patients died within 90 days, giving a 90-day mortality of 39%. Of the 18 patients who received a carotid ultrasound at 24–48 h, the stent was patent in 17, with only one thrombosis. Of the 14 patients alive at 90 days, 13 had follow-up ultrasound ranging from 90 days to 24 months (one did not return for follow-up in person due to severe disability). There were no delayed stent thromboses. Symptomatic intracranial hemorrhage (SICH), using the definition from the SITS-MOST trial, occurred in five patients (22%), all within 24 h of treatment and all of which were ultimately fatal.1 The pattern of the hemorrhage was intraparenchymal hemorrhage centered in the basal ganglia in all cases (figure 1). Of the 13 patients who received an intravenous bolus of abciximab, four had SICH (31%). Of the 10 patients who did not receive abciximab, only one had SICH (10%). None of the seven patients who received intravenous tPA prior to the intervention had a hemorrhage, including one who also received abciximab due to acute thrombosis of the stent during the intervention. The five patients who had SICH were older than the mean (71–86 years), with three of them aged >80. Serum blood glucose on admission was not available for one patient with SICH, who did not have a history of diabetes, and was less than 200 mg/dL in the other four patients. Of the 108 other patients in our stroke database who did not receive a carotid stent during the same time period, only three had SICH (3%), all M1 MCA occlusions. (A) Small initial basal ganglia core infarct on MRI diffusion weighted imaging. (B) CT at 6 h, large hematoma centered in the basal ganglia. Intracranial hemorrhage is a well-known complication of endovascular stroke treatment, although the incidence varies. PROACT II is the only study demonstrating clinical effectiveness of endovascular stroke treatment (intra-arterial thrombolysis) in a randomized trial.2 Patients with isolated MCA occlusions (M1 or M2) had not received intravenous thrombolysis and were treated within 6 h. Occlusion of the ICA was an exclusion. There was 10% SICH with a 90-day mortality of 25% and favorable clinical outcomes (mRS ≤2) in 40%. Various endovascular devices have FDA approval for mechanical thrombectomy within 8 h onset of ischemic stroke based on single-arm prospective trials designed to demonstrate safety and technical success of the devices or prospective randomized trials comparing devices. Prospective registry trials of newly introduced iterations of devices have also been published.3–7 An occlusive proximal carotid lesion excluded patients from these trials. SICH in these trials ranges from 2% to 11%, and technical success rates, which use different definitions, range from 61% to 82%. Favorable clinical outcomes (mRS ≤2) range from 25% to 37% and mortality from 18% to 38%. The IMS III trial compared endovascular therapy plus intravenous thrombolysis with intravenous thrombolysis alone, and failed to demonstrate any additional clinical efficacy of the endovascular treatment but did show a trend towards improved outcomes in patients with proven large vessel occlusions and those with higher NIHSS scores.8 MR RESCUE also failed to demonstrate clinical effectiveness of endovascular stroke therapy in a group of patients selected by MRI perfusion and diffusion imaging, ineligible for treatment with intravenous thrombolysis, and treated either with mechanical thrombectomy or standard medical treatment.9 The SYNTHESIS trial also failed to demonstrate a benefit of endovascular therapy using a strategy of randomizing patients within 4.5 h to intravenous tPA or endovascular treatment, which included intra-arterial thrombolysis and/or mechanical thrombectomy (in a minority of cases).10 A target large vessel occlusion was not confirmed prior to randomization in the SYNTHESIS trial. Large vessel atherosclerosis was reported as the cause of the stroke in 30% of the patients, but the authors did not comment on whether any of those patients had extracranial carotid occlusions or were treated with extracranial carotid stenting. SICH within these randomized trials ranged from 4% to 6%. Favorable clinical outcomes (mRS ≤2) ranged from 29% to 41% in the interventional patients and 90-day mortality ranged from 14% to 21%. In both the IMS III and SYNTHESIS trials, patients were enrolled in the interventional arm without confirmation of large vessel occlusion, hence the prevalence of proximal (M1 and carotid terminus) occlusions is probably less than in the present series. None of these prospective trials enrolled the population reported here because patients with extracranial carotid occlusion and those aged over 85 were excluded. However, the 22% incidence of SICH reported here is clearly higher than that reported in patients not requiring a simultaneous carotid intervention. Notably, of the 108 patients within our own database who did not require a simultaneous carotid intervention (and hence did not also receive abciximab), SICH occurred in only 3%. Qureshi et al13 reported seven cases of fatal ICH after administering abciximab during neurointerventional procedures. All of these procedures were elective revascularization procedures for recently symptomatic atherosclerotic lesions (either transient ischemic attack or non-disabling stroke). All of the patients concurrently were receiving aspirin and clopidogrel (six patients) or clopidogrel alone (one patient) and all also received intravenous heparin, with the activated clotting time in excess of 300 s in four cases. Four of the cases were extracranial carotid stents and three were intracranial stents. It is unclear from the paper why abciximab was administered in any of the cases, other than a perception that the patient was at ‘high risk for ischemic complications’. Abciximab does not appear to have been administered for rescue therapy. In the present series, abciximab was expressly not administered if the patient was already on clopidogrel, and heparin was administered only in low doses (see table 2). In a retrospective review of patients receiving abciximab during neurointerventional procedures (angiograms, aneurysm coiling, stenting, ischemic stroke intervention), Walsh et al14 reported that 9/51 cases developed SICH, with four fatalities. All but one of the patients was also receiving anticoagulants and antiplatelet therapy. The majority of cases involved administration of abciximab for rescue therapy during aneurysm treatment. Abciximab was administered in 11 cases of acute stroke intervention, seven of which received carotid stents and two had intracranial stents. Three of these 11 patients had SICH. Other authors have reported case series of the acute treatment of tandem carotid and intracranial occlusions. In 2003 Wang et al15 reported a series of six cases of acute atherosclerotic ICA occlusion with intracranial embolization treated with endovascular carotid intervention (percutaneous transluminal angioplasty (PTA) in four cases and PTA/stenting in two cases) and intracranial thrombolysis. Five of the six had favorable outcomes, with only one hemorrhage which was an asymptomatic (headache only) subarachnoid hemorrhage. In 2005, prior to the availability of intracranial thrombectomy devices, Nedeltchev et al16 reported 25 cases of acute carotid stenting combined with thromboaspiration alone (9 patients) or combined with intra-arterial thrombolysis with urokinase (12 patients) for treatment of tandem carotid and MCA occlusions. The authors described passing an 8 F guide catheter as distally as possible and using that device for aspiration, and placing a microcatheter through the 8 F guide for additional aspiration and thrombolysis. Stents were deployed by ‘uncovering the stent’ with the guide catheter at the site of the occlusive stenosis. Despite achieving carotid revascularization in only 21/25 (84%) and TIMI 2 or 3 flow in the MCA in only 11 cases (44%), 14 of the patients (56%) had favorable clinical outcomes at 3 months, with just two cases of SICH (8%). The favorable clinical results despite successful revascularization in fewer than half the patients might in part be explained by the lower mean NIHSS score compared with the present study (12 vs 17) and the younger age of the patients (mean 59 vs 70 years). If one accepts that successful revascularization of the MCA is a major risk factor for hemorrhage, a lower rate of SICH might be expected in series with lower rates of revascularization. In 2011 Malik et al17 reported a retrospective review of 77 cases of carotid stenting combined with intracranial thrombolysis and/or mechanical thrombectomy (Merci, Penumbra). Successful revascularization trended lower than in the present series (77% vs 91%), which might be expected given improvements in technology, and favorable outcomes also trended lower (41.6% vs 52%). However, mortality was also lower (24.7% vs 39%), primarily driven by the lower incidence of SICH (10.4% vs 22%). Unlike the present study, Malik et al noted no correlation between SICH and the administration of GPIIb/IIIa inhibitors, but did note a relationship with the presence of a carotid terminus occlusion. There are several possible contributors to the higher observed incidence of SICH in the present series. First, the patients reported in the present series tended to be older (mean age 70 vs 63 years) and had a higher NIHSS score (mean 17 vs 15). Second, the incidence of carotid T or M1 occlusions was higher (91% vs 77%). Third, the disappearance of the intracranial occlusion after stenting was never observed in the present series but was observed in 26% of patients reported by Malik et al, hence 26% of the patients in that series did not require intervention for an intracranial occlusion. Dorado et al18 reported their experience in 24 consecutive patients requiring acute stenting during stroke intervention compared with 119 patients treated during the same time period who did not require stenting. Twenty of these stents were extracranial carotid stents. 75% of the stented patients were treated with mechanical thrombectomy. The two populations had similar age, stroke severity, baseline ASPECTS score, prior administration of tPA, presence of diabetes, blood glucose and baseline blood pressure. Patients receiving a stent were treated with 300 mg aspirin and 300 mg clopidogrel by nasogastric tube prior to the procedure. Antiplatelet therapy was withheld for 24 h for those not stented. Similar to the present study, SICH occurred in 20.8% of patients who were stented compared with just 2.5% of 119 patients not stented. Placement of a stent was an independent predictor of SICH. More recently, Spiotta et al19 described 16 cases of tandem occlusions treated with carotid stenting followed by mechanical thrombectomy in patients with a mean NIHSS score of 13 and mean age of 67.8 years. They reported good clinical outcomes (mRS ≤2) in nine patients (56%), but just one case of fatal hemorrhage within the core infarct despite a more aggressive antiplatelet regimen (intra-arterial loading dose of abciximab, 600 mg clopidogrel and 325 mg aspirin immediately after the procedure). There was one 3×2 cm asymptomatic right parietal hematoma and seven patients with small subarachnoid or petechial hemorrhages, none symptomatic. The reason for the difference in the experience of Spiotta et al and our own is uncertain, especially given their even more aggressive approach to antiplatelet therapy. It may just be due to the small sample size of both series. Within our own experience, SICH occurred in just two of our first 16 patients. The cause of a potential increased risk of SICH in patients treated with emergency carotid stenting and mechanical thrombectomy remains speculative. First, this group tends to have more proximal occlusions and hence established infarction of the basal ganglia is almost always present. In all five cases of SICH reported here, hemorrhagic conversion of the basal ganglia infarct appears to be the mechanism. Second, acute stenting may re-establish flow dynamics that have been absent for some time and, combined with the presence of established infarction, this may increase the risk. Third, the use of more aggressive antithrombotic therapy, particularly antiplatelet medications used to prevent stent occlusion, may also increase the risk. Carotid terminus and M1 occlusions have relatively low early revascularization rates with intravenous tPA alone, about 25% by transcranial doppler.20 It stands to reason that such patients who also have a proximal carotid occlusion or near occlusion would have even lower rates of recanalization. Hence, the high frequency of revascularization achievable with endovascular techniques is promising. However, the optimal management of the competing concerns of revascularization and maintaining patency of the vessels and avoiding hemorrhage is as yet not defined. Of note, the one patient in our series who had acute thrombosis of the carotid stent within 24 h maintained patency of the MCA and had a favorable clinical outcome (figure 2). While clearly this is just one case, hemorrhage should possibly be feared more than stent thrombosis or carotid re-occlusion, and perhaps stenting and aggressive antiplatelet therapy should be avoided when possible in the acute stage. Also of note, the two patients with failed revascularization of the MCA also had a favorable outcome (mRS 0 and 1 at 90 days), emphasizing that the natural history of patients with proximal occlusion and good collaterals is not known. We have changed our treatment algorithm to attempt angioplasty alone first in order to gain access to the intracranial vessels, and stent placement only when angioplasty alone is insufficient. We have also eliminated routine administration of abciximab when a stent is placed. (A) CT angiography showing occluded carotid stent the morning after the intervention. (B) CT angiography showing that the left middle cerebral artery remained patent despite stent thrombosis and there was no infarct extension. This study has obvious limitations, including the single-center retrospective design, small sample size, and lack of a core laboratory for independent confirmation of both the angiographic and clinical results. However, the data presented here indicate that primary stenting of the extracranial carotid artery combined with mechanical thrombectomy can be an effective treatment for acute atherosclerotic occlusion of the carotid artery with intracranial thromboembolism. The procedure can be performed with a high rate of technical success and with good clinical outcomes in selected patients. However, the incidence of SICH may be higher than in other patient populations and may be associated with the use of abciximab and advanced patient age. While randomized trials addressing this patient group would be ideal, such studies are not likely to occur for a very long time, if at all. Submission of all cases to quality endovascular stroke registries, while imperfect, is more likely to provide further insight. In the meantime, endovascular stroke specialists must take into account a potential added risk for this patient group when considering the option of endovascular treatment with acute carotid stenting compared with other interventional options or standard medical care. The authors would like to acknowledge Crystal Myers, Triad Radiology, for her unwavering support and rigorous data collection.
. Mechanical Thrombectomy for Acute Ischemic Stroke: final results of the multi-Merci trial. Stoke 2008;39:1205–12. Contributors DVH: Conception, data analysis and interpretation, manuscript preparation, responsible for the overall content. MDB: data analysis and interpretation, manuscript revision. Ethics approval The study was approved by the Novant Health Forsyth Medical Center Institutional Review Board.